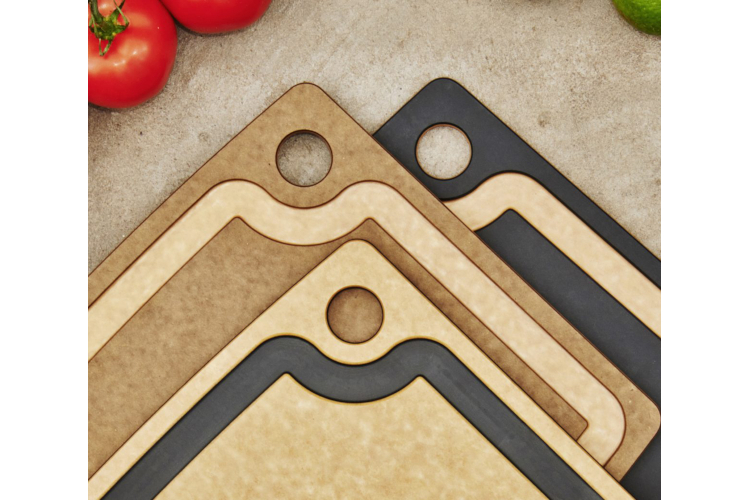 The Gourmet Series Cutting Boards from Epicurean feature a thicker profile to integrate a juice groove on one side to capture liquids and keep countertops clean. The dual-sided boards show a flat surface on the reverse side of the groove. The side with the groove is designed with a color accent in the recessed area, creating a striking design. Gourmet Series boards are 3/8" thick and are slightly heavier than the regular Kitchen and Nonslip series. Beautiful for serving as well as hard-working for prep work. All boards from Epicurean are made in the USA from natural wood fiber composite laminate. Available in a variety of shapes, sizes and colors, they offer a unique surface that is dishwasher safe and will not dull knives. 19.5" x 15" x 3/8"
17.5" x 13" x 3/8"
14.5" x 11.25" x 3/8"